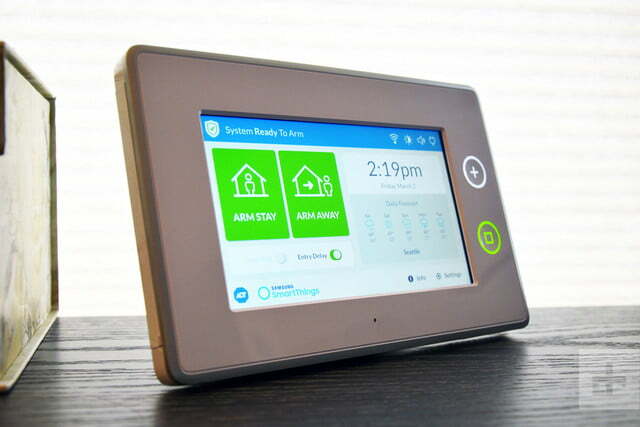 ADT is still testing the waters instead of fully embracing the DIY home security movement. A few years ago, a former ADT employee left the company to start his own security company – Abode — that offered month-to-month monitoring instead of the usual two-to-three-year contracts. 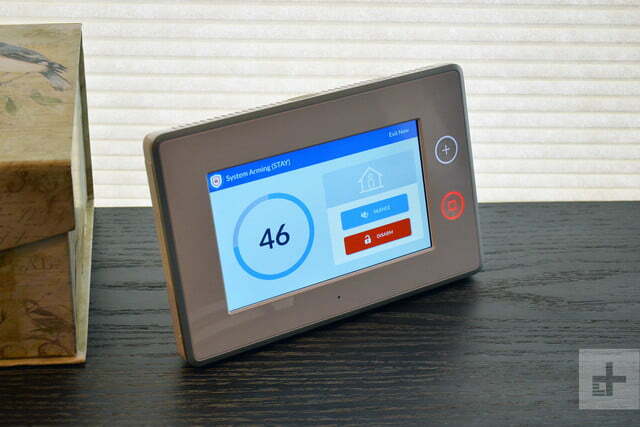 At the time, DIY security systems were starting to flood the market, letting homeowners and renters buy the equipment and receive notifications if something tripped their sensors. 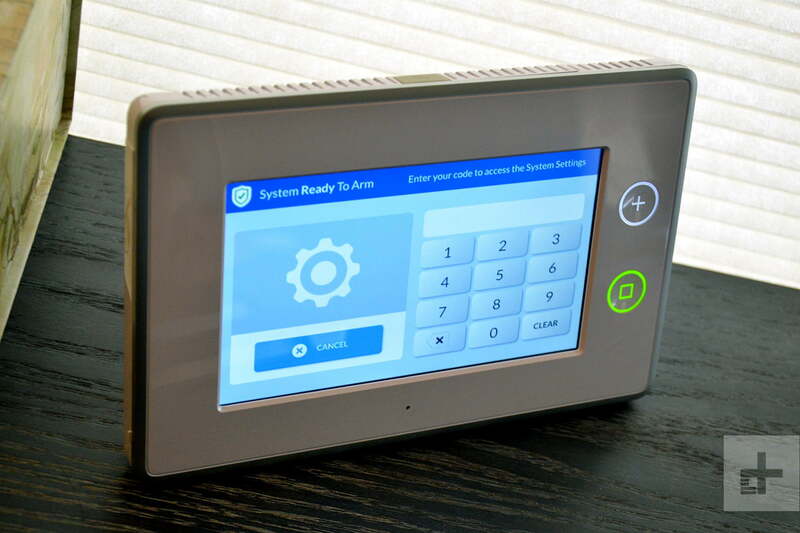 Eventually, ADT got into the game, and last year it partnered with Samsung’s SmartThings to launch a Home Security Starter Kit. 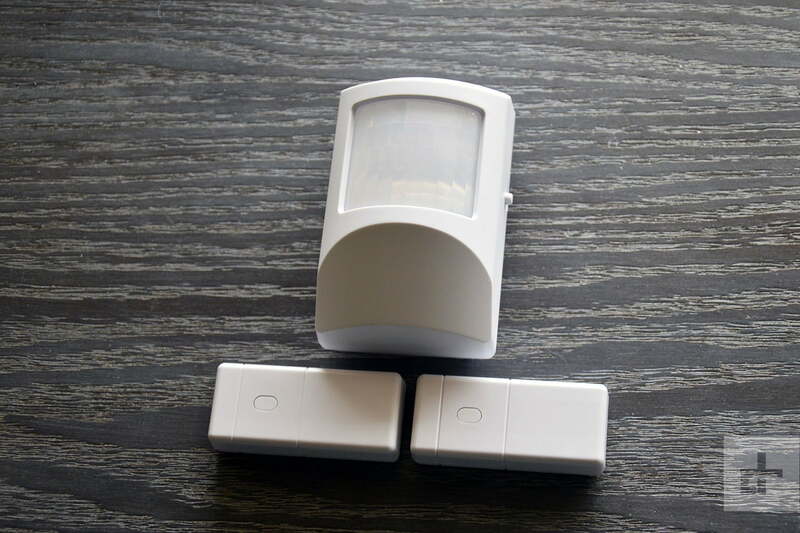 It comes with a tablet-like hub, motion detector, and two door/window sensors. You can opt for professional monitoring at different pricing tiers or have it be fully DIY. 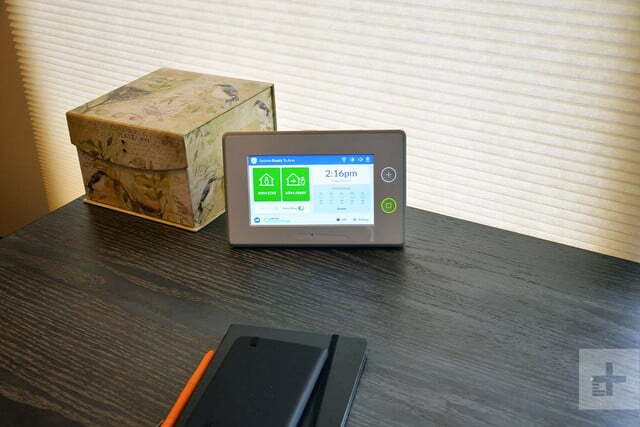 The tablet acts as a SmartThings hub, letting you connect all sorts of devices from a variety of brands. But — and this is a big but — to get full use out of the device, you’ll need to purchase ADT accessories. This four-piece kit isn’t the most robust security starter kit we’ve seen. Originally priced at a whopping $550, you can now find it for $400. The sensors are the standard white plastic (we still think they look awful). The hub is mostly screen with a few buttons. You can control it via the 7-inch touchscreen or from the SmartThings app. The hub’s top button takes you to an emergency screen, with three large icons: Emergency, fire, and panic. If you have ADT monitoring, you can press the corresponding icon for two seconds to alert the company that something’s wrong. The bottom button returns you to the home screen. The home screen displays arm and disarm buttons and shows the local weather. You can also see a history of events, add users, and mess with a few other settings, like screen brightness and sounds. Setting up the kit is relatively straightforward. First, you connect the hub to your Wi-Fi via the touchscreen. Once it’s connected, it will check and install updates, a process that took about eight minutes for us. The hub will display a code that you need to input into SmartThings app. The app will want to know your location, so it can do things like turn off lights automatically when you leave home. To add the sensors, don’t take the plastic tab out before you’re told. You can still set them up if you already have, but it’s more annoying. You’ll use your phone to scan the sensors’ QR codes, and they should easily pair. The motion sensor comes with a mounting bracket, or you can use the included adhesive tape for a less-permanent set up. An included booklet gives tips for proper placement of the sensors. The security kit can transition from professionally monitored to DIY and back again. The app will prompt you to set a location for these devices. There’s a list of locations and rooms to choose from that are kind of… odd. You’re supposed to pick two that fit together from the list of options. So you could have the location as kitchen and the room as also kitchen, or go for something a little more exotic, like sun porch, computer, cave, or crawl. One of our door sensors is currently set to the location of baby’s theater. (It’s where we watch Dirty Dancing.) That’s only because there is no living room option. They seem to do their job, though: Our cats didn’t set off the motion sensor, though ADT says larger dogs will definitely trip them. It’s a bit concerning that we weren’t prompted to change the hub’s default passcode upon setup. It’s a step people tend to forget or ignore, and for something as important as a security system, you would think it would be mandatory. Instructions for doing so are included in the setup manual, but without prompting, we worry it won’t occur to some users. Because the ADT hub is a replacement SmartThings hub, it can work with all kinds of smart lights, locks, and so forth — basically anything that works with SmartThings. However, while it can control these as a normal hub would, it doesn’t truly incorporate them into the security ecosystem. 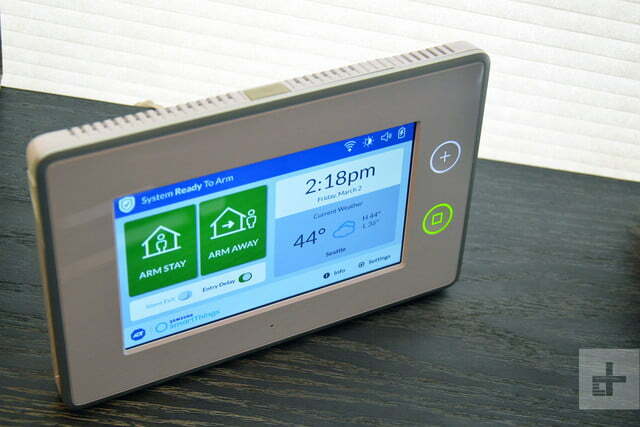 There’s a bit of a silo between ADT products and all other smart devices. Essentially, to trigger an ADT monitored event — like them contacting the police or fire department — the device that triggers the alert has to come from ADT. If you have a smart FirstAlert smoke alarm, you can still get notified when it goes off, but ADT won’t know about it. Our Nest smoke alarm isn’t compatible with the hub at all, so that was a complete nonstarter. Right now, ADT has compatible water leak detector ($35), smoke alarm ($80), and carbon monoxide alarm ($90) that work with the professional monitoring service, along with the $25 door/window sensor and $40 motion detector. 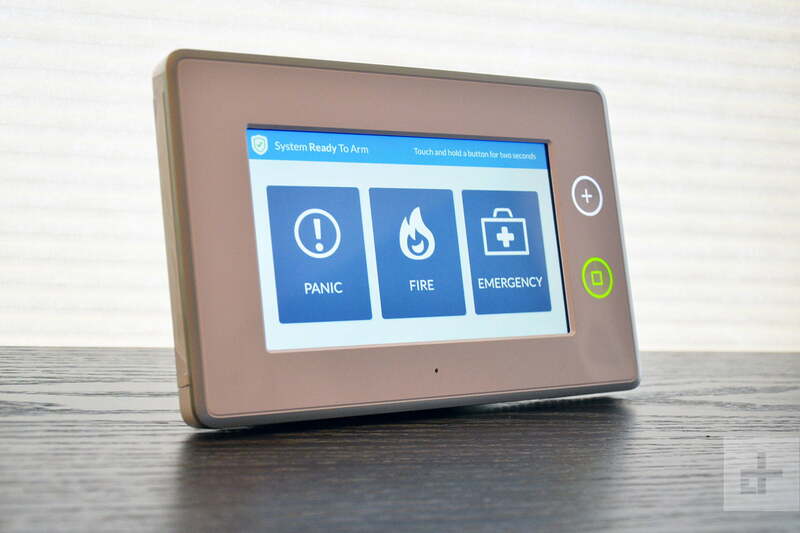 There are three types of monitoring: fire, carbon monoxide, and water leaks for $15 a month; intruder and panic alerts for $25 a month; and both for $35 a month. You can add or cancel the service fairly easily via the app, and you can continue to use the gear as a DIY system. At the moment, there are no ADT cameras that work with the professional monitoring system (though you can still use SmartThings-compatible devices for DIY monitoring). If you do opt in for the monitoring service and an alarm trips, ADT will call the number you provided (after giving you a bit of a grace period to cancel a false alarm). If you answer and all is well, you can provide a pin code to call off the troops. If you don’t answer, ADT will try your back-up number, and your designated backup will have to provide the magic word. Failing these, the company will send the proper authorities. We did manage to automate a few devices to work in conjunction with the security aspects of the hub. We set up a scene for all our Hue light bulbs to turn red when the motion detector triggers and the system is set to armed (away). The difference between armed (away) and armed (stay) is that the motion detectors don’t activate when you’re home, nor do door/window sensors you’ve configured with certain settings. This is something that can be accomplished with other security systems either out of the box or via something like If This Then That. Our cats never set off the motion alarm, saving us from unnecessary notifications. In the interest of preventing false alarms, SmartThings informed us that you can’t auto-arm the system via geofencing. It seems like you can in the app, but in reality, if you set the system to turn on armed (away) when you leave the premises, the hub will ignore the command. There also doesn’t seem to be a way to schedule arming or disarming the system, so you’ll have to either use the touchscreen, app, or key fob to do so when leaving or arriving home. This all seems to be in the interest of avoiding setting off the system by mistake. False alarms are annoying and can be costly with professional monitoring, so it makes sense. However, it seems like there could be a different set of standards for the DIY version. Surprisingly — though both SmartThings and ADT’s Pulse work with Alexa and Google Home, this security hub does not. One final quibble is the limited uses of the hub. Putting a screen on a hub and then giving it such limited functionality — especially when it makes up the bulk of the cost of the starter kit, feels like a missed opportunity. It’s great that there’s another call-for-help option in the form of an emergency button (if you’re paying the monthly monitoring fee), but you can’t set scenes, add devices, or do really anything SmartThings-related from the touchscreen. It’s possible this on purpose – ADT might not want you (or your kids) messing with the hub too much, lest you accidentally set off a call for help. SmartThings offers a one-year limited warranty on this starter kit. ADT is trying to offer a more flexible option than its old-school, three-year contract plans that start at $37 a month. 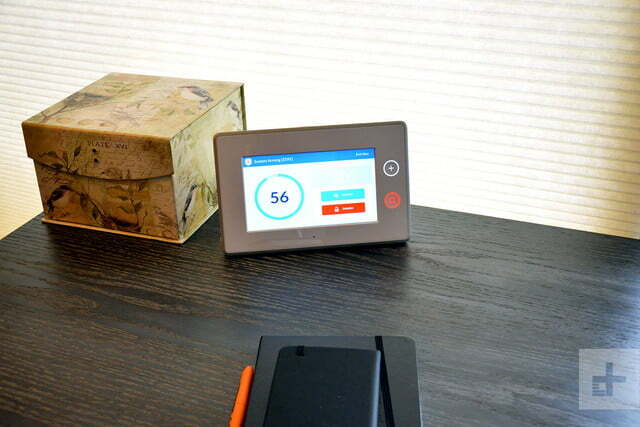 Partnering with SmartThings is a good move, but at the end of the day you’re still beholden to ADT’s gear to take advantage of its professional monitoring. The $200 motion sensor-based Aura system is just sensors and beacons and works with Alexa, Google Home, Philips Hue, and IFTTT. It doesn’t have a professional monitoring option. Abode’s $300 starter kit comes with a hub, key fob, door sensor, motion sensor, and is compatible with Nest. Professional monitoring is $30 a month, but you can also do DIY and schedule a long weekend or a week of service for $8 or $15. One of the least expensive monthly monitoring comes from Scout. 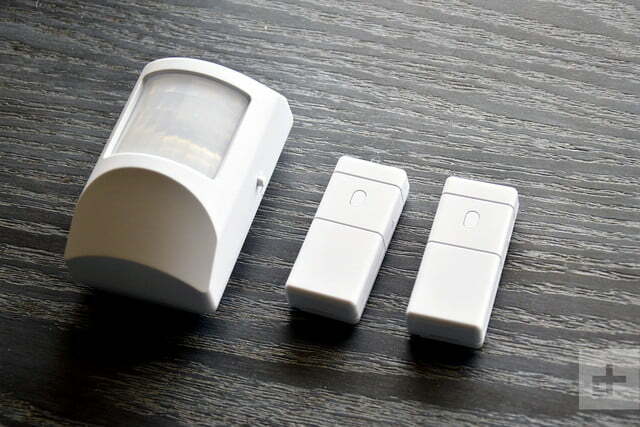 It’s $20 a month, and you can buy components separately: ($129 for the hub, $49 for a motion sensor, and $29 for a door/window sensor). It integrates with Nest, Hue, Lifx, Alexa, and Google Home, as well as IFTTT. 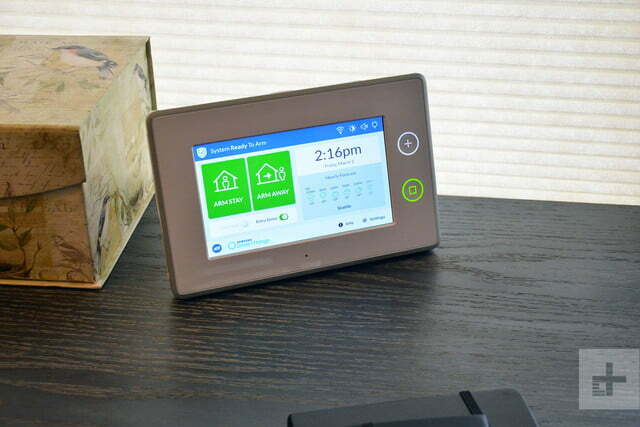 We’ll also be interested in checking out Honeywell’s home security system when it comes out this year. ADT has been around for over 100 years, so you probably don’t have to worry about them suddenly going under. However, we can’t promise the professional monitoring price will stay the same. On the other hand, they could deliver some updates to make the hub more robust or come out with some more equipment to expand the system. 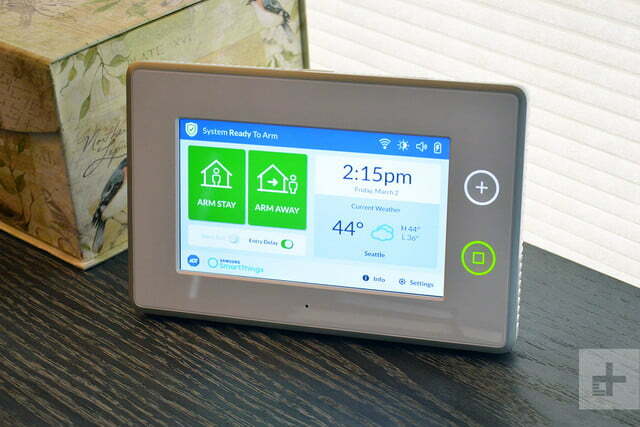 Even at $400, ADT’s SmartThings is more expensive upfront than other systems, as is the monthly monitoring. We get the feeling ADT is still testing the waters instead of fully embracing the DIY home security movement. If you need a security system today, we’d look elsewhere, but check in again once the company rolls out more hardware.